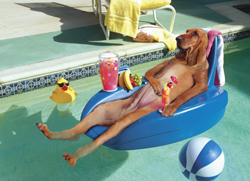 You are currently browsing the The Pet Product Guru blog archives for March, 2011. All dogs are required to be licensed. Licensing helps to find lost dogs plus helps to protect the public from diseases like rabies since all licensed dogs must be vaccinated. Here’s the licensing process. Have your dog vaccinated for rabies. Your Vet will let you know when your puppy is ready for this vaccination. Contact your local animal control agency for licensing information. Make sure you take proof of vaccination to the appropriate animal control agency at the time of vaccination. Be prepared to pay a fee. Fees are considerable less for spayed and neutered dogs and also for senior citizens. Affix the license to your dogs collar and keep the license paper with your other important documents. Renew the license as required. The animal control agency should notify you when it’s time for renewal. Have fun with your new puppy. Alway give him plenty of dog treats along with lots of love. Long dog leash or short leash? There was a law recently passed in Sandusky, Ohio that forces dog owners to keep dogs on leashes that are no longer than six feet long. The reason for the law is supposedly to prevent injuries to humans and other animals. Although some people are in favor of this law, many people are arguing that a six feet dog leash is not large enough when walking a larger dog since large dogs are harder to control on short leashes. So what’s your opinion? I believe that if the dog is trained well and the owner is responsible, a long leash will do just fine. Many people do not follow dog etiquette and let their dogs run and jump all over the place. We shouldn’t have to rely on these kinds of laws if citizens are responsible for properly training their dog and following the rules. If a dog is not trained properly, it could jump and possible knock down and injure a child or older person. While walking your dog, be aware and respectful of others around you. Panting is one method that dogs use to cool off. Breeds with pushed in noses and short faces such as English Bulldogs, pugs, Pekingese and boxers, tend to have a more difficult time in a hot climate. Giant dog breeds such as Newfoundlands and St. Bernard’s cannot handle exercise in hot weather as well as smaller dogs can. They are prone to sluggishness and obesity. Always make sure that his dog water bowl is filled at all times, especially during hot weather. I was reading today about a boxer named Roxy who during the Dec. 26th blizzard, broke lose from her dog leash, leapt over the fence of her Staten Island home and went on a two month adventure on her own. She must have gotten onto the Staten Island Expressway which was just a few blocks from her home and started running. She wound up in New Jersey, made it into Hudson County and ended up in Guttenberg which is about 20 miles away. Her exact route is unclear but she was picked up by the Guttenberg Police on March 5th after being spotted in the road without a leash. She almost got hit by a car. Roxy was well trained, didn’t seem intimidated or nervous at police headquarters and even gave a “high five” to one of the police officers. The officer took her to the Oradell Animal Shelter in Paramus where she was happily reunited with her owners more than two months later. An incredible story since the winter in the north east this year was brutal. Maybe Roxy had enough of the snow and decided to leave like we wish we could do. A great and happy ending and an incredible dog! It can be very dangerous if your dog gets into your garbage. He could left eat cooked bones which he could choke on and even kill him. He could eat food that could make him ill, not to mention other things like aluminum foil. If he is outside, make sure that the garbage cans are secure enough where he won’t be able to get into them. Get cans with a twist locking lid used to deter bears. Keep the lids on tight and keep the cans out of your dog’s sight it possible. 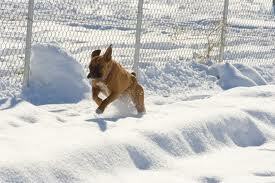 Consider different sprays that are available at pet stores which will deter your dog from going near the cans. There’s cayenne pepper and powders like bitter alum. Don’t depend on these sprays alone. 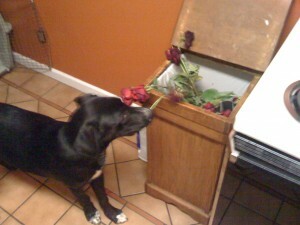 It is very important that you make sure that your dog cannot get in your garbage at all. 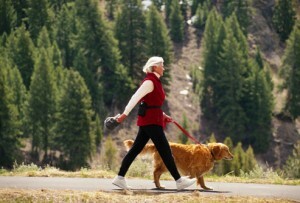 Keep your dog properly exercised. Have him fetch his dog toys on a regular basis. This will prevent a lot of bad behavior. A dog that is under exercised and under stimulated will be more likely to act out in destructive ways. What if an insect bites your dog? 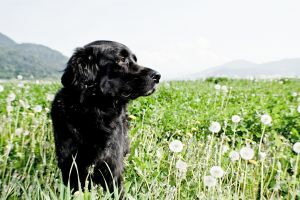 Most insect bites are not really dangerous to your dog but they could be very irritating and painful. Pet medications containing Aloe Vera or oatmeal may be helpful in relieving some of the discomfort. If your dog is stung by a bee, hornet or wasp, remove the stinger first. I know it may be tough to locate. Try using a magnifying glass if necessary and carefully pull the stinger out with a tweezers or your fingers. After the stinger is out, bath the area with a mixture of baking soda and water. Then apply cold compresses to reduce the pain and swelling. Repeat this several times. Some dogs will need immediate veterinary attention because they may be allergic to bites and stings. If you see that your dog has trouble breathing, get him to a vet right away. Also, if you notice that he’s disoriented, call your vet. In an emergency situation where you cannot get your vet, give your dog Benadryl. Ask your vet before hand what the proper dosage is. Always keep a close eye on your dog’s symptoms after he’s stung or bitten. Remember, not all people are dog lovers. If you live in a heavily populated area or a big city there are some things that you should remember with regards to your dog’s behavior. It’s up to you to present a dog who is well socialized and under control. If you’re in the elevator, keep you dog in the far corner so he doesn’t try to dash out every time the door opens. 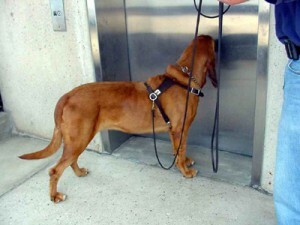 Never let your dog jump on the other people in the elevator. If your dog is not well socialized, make it a point to train him. In the meantime check with management to see if you could take a freight elevator or the stairs if you’re not on a high floor. Never allow your dog to soil in front of the building’s entrance. If you have a young pup or dog-in-training who can’t control himself, be sure to carry paper towels and odor neutralizer. If you are planning on visiting friends and you want to take your dog, always check to make sure that it’s ok to bring the dog. Make sure that your dog will not run through your friends home and possible destroy some valuable possessions . Make sure that your dog is trained and does not jump. Never just assume that taking your dog is “OK.” and never surprise your friends with your dog without checking first. Be considerate of others who may not be dog lovers or who may even be afraid of dogs. Always reward your dog with a dog treat for good behavior. Why do cats go crazy over cat nip? Is your cat getting high on cat nip? Why is this? What makes a cat go crazy over cat nip? It’s because of the plant’s natural chemical, trans-nepetalactone. It’s the smell rather than the taste that drives cats wild. 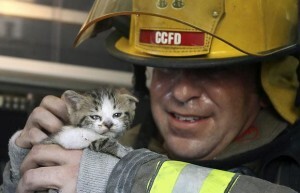 This is similar to the essence excreted by females cats which male cats really love. Females also love this scent. Kittens usually don’t respond to cat nip until they are about two months old. 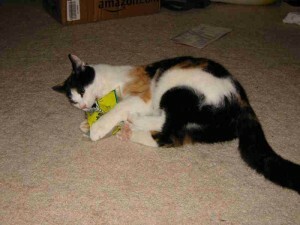 So instead of buying your cat a cat toy, try something that will make her feels like she’s in heaven – cat nip.